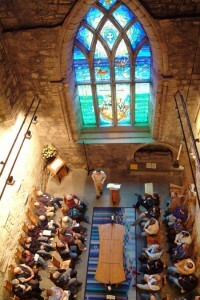 When the ideas for the redevelopment of the former East Kirk were first being worked on it was obvious that the planning law required archaeological work to take place within the area to be disturbed by the proposed building work. 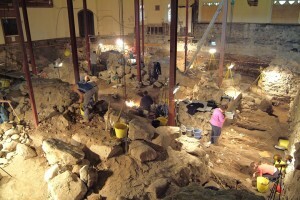 After some trial trenches in 2005 revealed well preserved, extensive archaeological deposits, it was agreed the area beneath the whole of the church floor would be excavated. This is approximately 20m by 20m and was to be taken down to the original ground levels of Aberdeen, which turned out to be between 2.5m and 3.5m deep. Earlier excavations in Collison’s Aisle (now St John’s Chapel, popularly known as the ‘Oil Chapel’) in 1974, together with the evaluation work more recently in 2005, demonstrated that archaeological deposits dating to the period of the 12th and 15th century structures were likely to remain below the present building. The dig did indeed uncover these remains together with those of an earlier building. Very little is known from archaeological evidence about the form and construction of pre-15th century Scottish burgh churches, so this work has added significantly to the knowledge. Over the centuries, as successive buildings were expanded, they incorporated into them what had previously been the burial ground. Therefore it was anticipated that there would be large number of burials. This proved to be the case. As expected, these provided evidence of burial practices and a large number of other artefacts also emerged. The human remains have already been studied in details and have produced a fascinating insight into the life, diseases, injuries and, in some cases, death of the people. Further work is ongoing. All the human remains will be reinterred, in a religious ceremony, below the floor of the new building which is to be constructed inside the exterior walls. The main dig started at the end of January 2006 and finished a few days before Christmas that year. For most of the dig, we were able to allow the public to come in to watch – the gallery was a very good grandstand! We also had a viewing window from the Drum’s Aisle to get a bit closer to the action. Twice a week one of the archaeologists gave a talk to the public on recent progress. In addition we offered visits to schools – which were fully booked very quickly. 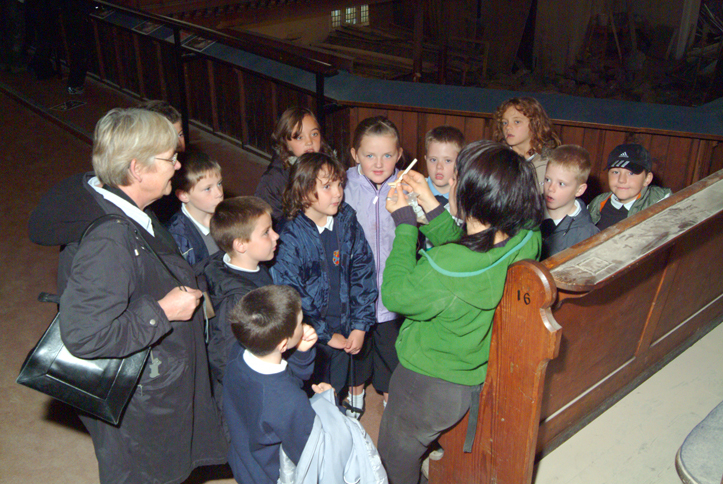 During these visits the children saw other parts of the building before seeing the dig, meeting some of the archaeologists and handling some of the finds. 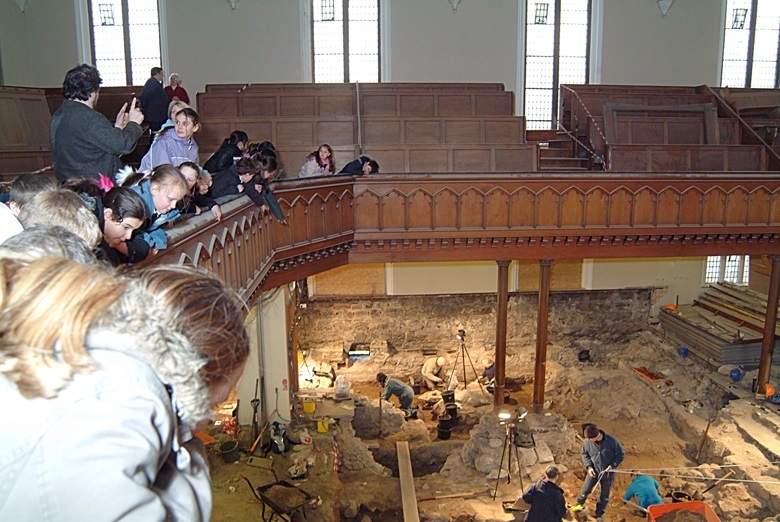 More than 14,000 people visited to see the archaeology in progress. It is vital that all these features (buildings and artefacts) are protected, conserved, studied, researched and the results made available. That process is slow and expensive. Some has been carried out, but financial support is not readily available for such work. In the blog section of the website we are periodically highlighting some of the finds. Also, during the dig there was a ‘weekly report’ and over subsequent months there were further updates. Originally these were published on the Aberdeen City Council website but have now been moved to an archive. The link is here. Some of the reports were also on a separate link and can be accessed through these links (Week 7, Week 8, Week 9, Week 10, Week 12, Week 13, Week 14, Week 15, Week 16, Week 17, Week 18, Week 19).